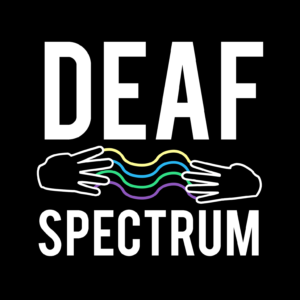 Check out our website at www.deafspectrum.com and sign up for our mailing distribution list to get updates on the latest on accessible events and opportunities for the Deaf community. If you want to e-mail us, we are reachable at info@deafspectrum.com and we can set up Skype to communicate in American Sign Language (ASL). Thank you for watching this vlog! The idea of Deaf Spectrum first emerged in 2013 after a group of young Deaf activists realized that there was a huge lack of accessible information in American Sign Language (ASL). The idea turned into action in Jan 2015 with our YouTube Channel. We primarily focus on bringing accessible resources to Deaf communities by producing sign language vlogs. -Editor (responsible to ensure that the videos adhere to the script and is clear enough for sighted audiences to see).